Anastasia is the Student Recruiter for our Master Programmes. 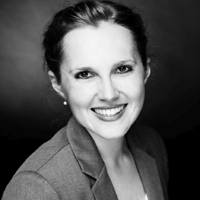 As a Career Services counselor for several years at Frankfurt School, she brings deep expertise in career planning and development. Prior to coming to FS Anastasia worked for universities in Eastern Europe & the US. As postgraduate students you will probably be aware of the significance of networking. I´ve already touched upon this topic in my previous post, but as it´s a highly complex process and many students avoid shaking hands and collecting business cards, I want to give some tips which you can put into practice during your Master´s studies. Get tips on career opportunities with companies in Frankfurt, Germany or abroad by one of our FS Career Services counselors. Let them show you how to apply and teach you best practices during the application process. This is a perfect first step and you´ll be well prepared for the next one. Our Career Services organise regular recruiting events and workshops in cooperation with companies of all industries. During lecture periods you have many opportunities to attend guest lectures, workshops or visit company offices. Don´t miss our Career Day in October, a campus fair which is an absolute must for any student. See every event you attend at FS as a networking opportunity. Companies do not come to a university just for your entertainment. But do not act like a stalker. Find out about the company and who will be attending the event. Very often you will meet FS Alumni, ask them about their experiences. Make sure you’ve done your research, but don’t be too keen. This is your opportunity to talk to people that you wouldn´t otherwise be able to talk to or find. Prepare some useful questions and find out if the person you are networking with can give you a helpful tip or even knows who you want to know. Prepare a 30 second elevator pitch and describe yourself concisely and impressively. Don´t forget that less is more. Use powerful points in very few words. By the way, you should bring your FS business cards but never offer your business card unless people ask for it. At most FS events there is usually some kind of presentation. Use these moments to calm your nerves (if necessary) and to think of questions you would like to ask. Ask open-ended questions which begin with ‘who’, ‘what’, ‘where’, ‘when’, and ‘how’. Avoid questions that can be answered with a simple yes or no. Open-ended questions open up the discussion. A straight “I want an internship” or “Do you offer student jobs?” is a killer. After you meet someone, use social media to keep the connection alive, especially if you don’t live in the same city or country. Use LinkedIn and XING (“German LinkedIn”) because they are essential tools for promoting yourself. Even if you haven´t met a person yet you can still start a conversation online. Maybe you’ll end up meeting this person for a coffee. Start with FS Alumni who work in a company that you would like to get to know as an intern. Having Frankfurt School or your Master´s programme in common is always a helpful conversation starter. Get your face known and be visible. Build your reputation as a reliable and supportive person, and have a positive influence on those around you. What goes around comes around: Be interested in all people, help others and ask “What can I do for you?” Maintaining your integrity is crucial as nothing destroys networking like a lack of trust. First of all, employers regard volunteering positively as it shows that you´re active, ready to get involved and develop skills like communication, teamwork and conflict management. Join an FS Student Initiative or volunteer in a relevant non-for-profit organization. Get to know the people there and build relationships. Are you too shy for this? Well, good news, networking is just the right thing for you as it pushes you to grow. You learn how to make conversations and lasting connections. Remember, it´s not about having the biggest collection of business cards or just showing up at an event and enjoy drinks. Take this low-cost marketing chance which the Frankfurt School community is offering you.